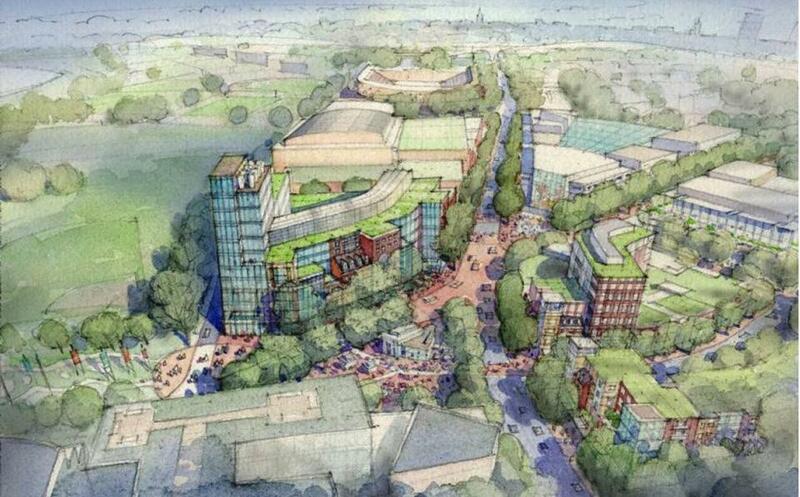 A rendering of Harvard University’s proposed Allston campus. Both candidates to be Boston’s next mayor say they would overhaul or eliminate the Boston Redevelopment Authority, raising the specter of sweeping change at a powerful agency that has defined development in the city since the 1950s. The dismantling of the BRA would fundamentally change the way Boston reviews major building projects that alter the downtown skyline and outlying neighborhoods. The authority has overseen a vast transformation of the city in recent decades, adding countless new commercial and residential buildings. But it has also attracted criticism from residents and businesses who have objected to its decisions and a process that often appears closed to outsiders. Mayoral candidate Martin J. Walsh unveiled a plan Thursday to replace the BRA with a new economic development agency whose director would work under a contract and be less beholden to the mayor’s office. He said the City Council would be given new authority to oversee the agency’s operations and finances, and members of the agency’s board would be subject to term limits. Walsh’s opponent in the election, Councilor John R. Connolly, has proposed similar changes to the BRA, advocating for a separation between its planning and development arms, as well as term limits for board members. He has also called for the establishment of more specific zoning rules across the city to prevent development from becoming subject to political manipulation. Connolly told a group of real estate professionals on Wednesday that the BRA “needs a serious injection of transparency.” He acknowledged that the BRA has many talented staff members, but said the authority suffers from a reputation of being too remote from the concerns of citizens and businesses in the city. The BRA was created in 1957 with a mandate to redevelop large swaths of Boston, which at the time was struggling with urban blight and a steady drain of businesses and residents. Since then, the authority has approved many building projects that revitalized large portions of the city and helped make it a magnet for business investment. Over the years, the authority has also become a primary instrument of power for a succession of mayors, including Thomas M. Menino, who has used it to pursue his vision for the city’s development. The BRA has also served as political tool to punish enemies and reward allies. The BRA board rarely votes against Menino’s priorities, and in recent weeks has continued to approve an array of major building proposals across the city. On Thursday night, the board approved a sweeping master plan for Harvard University’s expansion into Allston. It also approved a 52-story residential tower at Copley Place, a 283-unit apartment complex in Jamaica Plain, and an 11-story office building at East Berkeley and Washington Street in the South End. The possibility of dramatic change at the BRA after the election has helped spur developers to bring an unusually large number of projects before the authority’s board for approval in the waning months of the Menino administration. In fact, the meeting Thursday night was the BRA’s third in the past four weeks. The authority’s board normally meets once a month, but added more dates to accommodate the pile of proposals. Real estate professionals say a strong local property market and a favorable financing environment have driven some of the activity before the BRA. But they acknowledge that developers are also rushing now because of uncertainty over the city approval process once a new mayor takes office. Both Walsh and Connolly have cited the accelerated pace of board meetings — and development approvals — at the BRA and urged the authority to slow down. While Walsh offered praise for the work of the BRA’s current director, Peter Meade, he said the authority is no longer adequately serving the needs of residents and businesses and must be changed to more effectively harness business growth and job creation. Walsh offered a 14-point plan for pursuing economic growth in the city. The plan seeks to consolidate several city departments, including the BRA, into a new agency called the Boston Economic Development Authority. Walsh’s plan would require that a substantial portion of the new agency’s operations be funded under the broader city budget, not with the fees that developers and other property owners pay directly to the BRA now. His plan does not spell out how the city would pay that obligation. The new agency would have separate arms focused on planning and development review, and it would work with an “economic development Cabinet” with members coming from the city’s Transportation Department, Inspectional Services, Environmental and Energy Services, and other key bodies. Connolly has not yet outlined a specific vision for restructuring the BRA, but has been equally adamant that it must be overhauled to better meet the needs of residents and businesses. He said, in particular, that the city’s building rules must be changed to encourage construction of housing that’s more affordable to low- and middle-income residents.